The Next AFL Legend — The Mongrel Punt Become a Patron! Malcolm Blight is just getting used to being the new kid on the block in terms of Legend status, but with Hall of Fame numbers set to top 280 in 2018, the AFL can elect to elevate it's 28th Legend of the game. The criteria specifically states that only ten percent of total inductees can be raised to legend status. Thus far, the legendary list reads like a who’s who of the football world. Barassi, Matthews, Baldock, Bartlett, Robran, Coventry, Dyer… there is no doubting their standing in the game, but as we get nearer to the next ceremony, discussion about who the next legend of the game will start to ramp up. Of those currently in the Hall of Fame, there are a few standouts that’ll definitely make the shortlist of any selector. And just who are those selectors? Former Carlton great, Mike Fitzpatrick heads up the ten-person committee, and is joined by secretary, Patrick Clifton, historian, Col Hutchinson, and selectors - Dennis Cometti, Matt Finnis, Jim Main, Bruce McAvaney, David Parkin, Stephen Phillips and Michaelangelo Rucci. Who will be at the top of their lists to become the 28th Legend of the Game? They called him ‘God’ for a reason, and one look at Gary Ablett’s spectacular 1989 finals series emphasizes why. Whilst most will remember his electrifying nine-goal performance against Hawthorn in what many believe is the greatest Grand Final of all time, they forget about his performances in the lead up. The next week, he was taking it one step further to propel the Cats into the Grand Final. Along the way, he collected 23 touches, 10 marks and kicked 8.5. Then there was his herculean Grand Final performance. For those three weeks, Gary Ablett was untouchable, and was viewed as the undoubted best player in the game. Amazingly, this was not Ablett's greatest season. If anything holds Ablett back from reaching Legend status, it may be on the basis of character. This is a large reason for the delay in his initial induction into the Hall of Fame. The AFL states that it may consider integrity, sportsmanship and character when making an induction. My thoughts – he’s already in the Hall of Fame; so we've already crossed the “character” bridge once during the first induction. It should not impede his elevation to legend status. How does 10 SANFL premierships sound to you? What’s that? You think that was a typo? Nope, TEN premierships as both player and coach headline the achievements of Fos Williams in Aussie Rules footy. Starting his footy career at 24 due to service in World War 2, Fos won his first flag as a player in 1947 with West Adelaide, and won his last as coach of the Port Adelaide Magpies in 1965. Think about that for a second. In the 19 years from 1947 until 1965, Fos was involved in a premiership win once every 1.9 years. 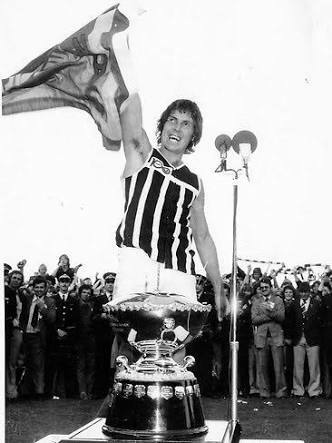 Adding to that, as if it is required, he captained South Australia five times, won two Best and Fairest awards at Port, and lead the Magpies in goal kicking three times. Fos would be the second man to be hailed as a legend without competing in the VFL/AFL, after Barrie Robran’s elevation in 2001. The King took the Centre Half Forward position to a new level in the 90s. 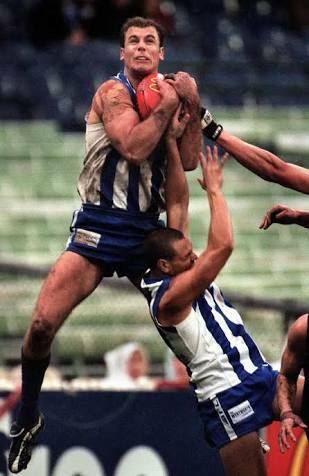 His courageous marks and on-field leadership were the catalyst for two North Melbourne flags. Seven All-Australian selections (four named as captain) and two Leigh Matthews trophies are just two of the accolades bestowed upon Carey. His marks running with the flight of the ball, and the way he imposed himself on a game in a five minute burst of sensational football still linger in the memories of North Melbourne supporters, and the opposition supporters that saw him tear their team to shreds with those bursts. Unfortunately, some of his indiscretions may work against him. Similar to Gary Ablett, Carey has seen his share of negative press, and it has largely been a result of his own doing. There is the chance that there could be a backlash should The King be elevated in 2018, however, similar to Gary Ablett, Carey's initial induction in 2010 may have allowed enough time to pass; perhaps he has served his penance? His footballing resume cannot be doubted, but at this stage, The Mongrel thinks The King may have to wait a little longer to be crowned a legend of the game. His time will definitely come, though. When you look at Lou’s playing career on paper, it isn’t as glowing as some of the others in line to be elevated. 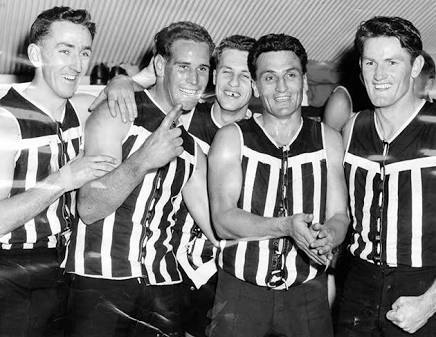 He played 250 games, captained his beloved Magpies to the 1953 flag, and led them in goal kicking three times, but the on-field accolades aren’t enough to propel Lou into Legend Status. 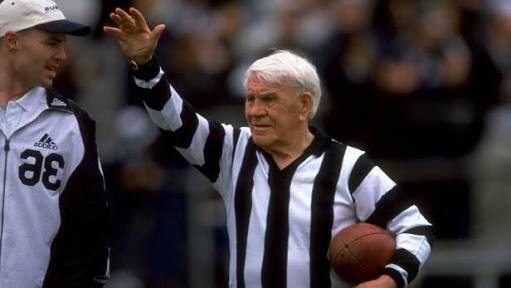 Lou Richards became the voice of the VFL after his retirement from the game. He was a bit like a Jedi. Once his career was over, he became even more powerful. Whether he was making his infamous “Kiss of Death” tips and paying the price when he got them wrong, hamming it up on World of Sport, or engaging in arguments with mates Jack Dyer and Bobby Davis on League Teams, Lou was close to the biggest personality in the game. For a Collingwood personality, no one has been as universally loved as Louie the Lip. A posthumous elevation for Lou Richards would not be a reward for what he achieved as a footballer. It would be for what he contributed to football. Sadly, the AFL has ruled that only playing and coaching records can qualify a member for elevation to legendary status. For Lou, his on field exploits are just not enough. He'll remain a legend to many, despite never being an official AFL Legend. The old master has a strong claim to reach Legend Status. Already considered a legend by every Essendon supporter, and many begrudging opposition supporters, Sheeds made football fun. Seven premierships as coach and player highlight the Sheedy CV, but similar to Richards, Sheedy was more than a player and coach. He became part of the fabric of the game even when he didn’t have an official game day role. Sheedy was responsible for the moves in the 1984 Grand Final, which saw Essendon slam home nine last quarter goals to overrun a Hawthorn team that led by 23 points at three quarter time. He was also responsible for tying down the windsock at Windy Hill to try to confuse the visiting West Coast team in 1991. He was a jacket-waving, innovative football maestro, creating memorable events and playing a part in establishing iconic games on the calendar, such as the annual Anzac Day and Dreamtime at the 'G contests. He is a monument to the game, clad in red and black (and yes, yes... yellow and black before then). Sheedy was named in the back pocket in Richmond’s Team of the Century, and is the coach of Essendon’s Team of the Century. It doesn’t get much more legendary than that. Lockett and Dunstall. There was never one discussed without the other being brought up during their careers. Lockett was the man-mountain in the St Kilda, then Sydney goal square, whilst Dunstall was the hard leading, chest marking spearhead of the Hawks. There is only one place where the two are clearly separate - currently, only one resides in the Legends category in the HoF. Dunstall sits third all-time in total goals scored, behind only Lockett and Gordon Coventry (another already in the Legends category). Whilst he is behind them in goals, he is ahead of Lockett in premierships, but trails Coventry by one. When you’re involved in 664 games of professional football, you must be doing something right. Graham Cornes may not have the kind of CV that stacks up against the Gary Abletts or Wayne Careys of the world, but he was as important to South Australian football as anyone in his day. He won his only SANFL Flag as a player in 1973 with Glenelg, but added two more as coach in 1985-86. Cornes had a brief dalliance with the VFL in 1979. After just five games with the Ron Barassi-coached Kangaroos, he was dropped from the senior side. Cornes returned to South Australia and never played in the VFL again. Cornes was an inaugural inductee into the South Australian Football Hall of Fame, and remains one of the loudest voices in SA when it comes to footy. Those seven premiership cups as a player are hard to argue with. Tucky helped march the Hawks through their most successful era, and that’s saying something given the team’s recent exploits. Over the course of his 426 games, Tuck played in a record 39 finals games, six in front of fellow-Hawk, Shaun Burgoyne. He has also played in the most winning teams in AFL/VFL history, with 302 wins to his name. Hawks fans are starting to beat their drums to include Tucky as an AFL Legend in 2018. 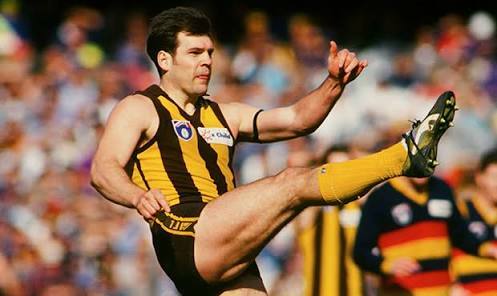 He held the games record until Boomer Harvey finally passed him in 2016 and was runner up in Hawthorn’s Best and Fairest award an incredible seven times due to another AFL Legend racking up B&Fs at the time- Leigh Matthews. Tucky may not have received the awards of some of his contemporaries, but he was a leader of men, and a leader who helped pilot a Hawthorn team to greatness in the 1980s. There was a time when people wondered whether Doug Wade was the best full forward of all time. This seems to be forgotten now as the likes of Lockett and Dunstall happened by, and passed him on the all-time goal kicking list. However, throughout the 1960s and into the 70s, Wade was a scoring machine, racking up 1057 goals for both Geelong and North Melbourne. Wade is a dual premiership player, winning in 1963 with the Cats, and 1975 with the Kangaroos and once slammed through seven goals in the final quarter of a match against Collingwood at Arden Street. 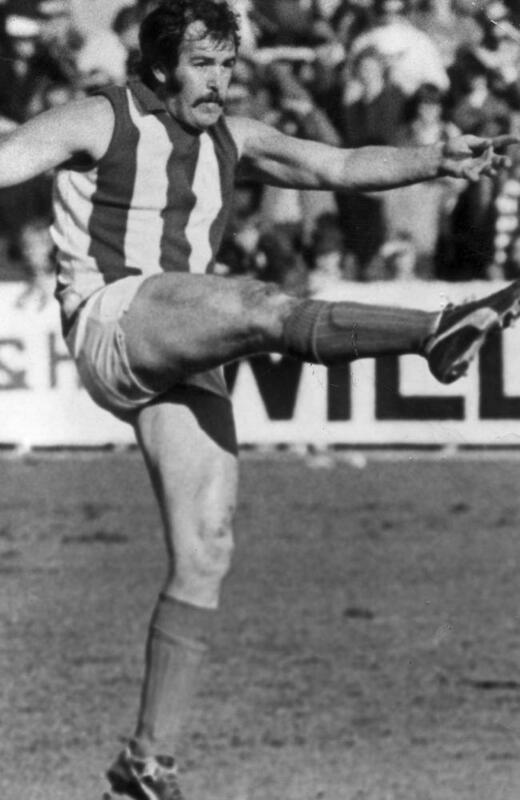 Famously, Wade was kicking for goal in late 1970 to pout his Cats in front of the Swans. A spectator threw an apple onto the field and it connected with the ball as Wade was dropping it onto his foot. The umpire called play on, and the Swans took the ball the length of the ground to score, and seal the game. Wade finished his league career with an average of 3.95 goals per game, and has four Coleman medals to his name. He was a powerhouse with sure hands and an absolute superstar in his era. There is no coach more synonymous with a club than John Cahill is with Port Adelaide (Yes, I realise Sheedy is on this list). Ten premierships as coach of the Magpies makes him one of the most successful coaches in the history of Aussie Rules. When you add to that the four premierships he won with Port as a player, now you’re talking a complete career. Combining his playing and coaching career together, Cahill competed in 888 games of professional Aussie Rules football for Port Adelaide, Collingwood, West Adelaide and South Adelaide. From 1977 to 1995 (19 seasons) he won ten premierships with the Port Magpies, at an average of one every 1.9 years, matching the feats of Fos Williams above. It’s no wonder there are two types of people in South Australia – those who barrack for Port Adelaide, and those who hate them. One fact sets Ebert apart from many others when considering his credentials - he is the only man to ever win four Margarey Medals as the best player in the SANFL. Combine that with winning the inaugural Jack Oatey Medal for best on ground in the SANFL Grand Final in 1981, and you have a compelling case for Ebert's elevation. He ventured to the VFL in 1979, when he was "leased" to North Melbourne for a year. In that year he led the Kangaroos in disposals and polled nine Brownlow votes. His 25 games is the most by any player to ever have only played one VFL season. His 41 disposal game versus Melbourne in Round 20 gave Victorian fans an indication as to what he could do, but this was something that South Australian fans were treated to regularly in the years before. Ebert holds the club record at Port Adelaide with 392 games, and was named in the Centre as part of Port Adelaide's greatest team. So there’s The Mongrel’s shortlist of potential legends. Who do you think has the best shot at taking the step into the upper echelon of the AFL Hall of Fame in 2018? Give us a yell on Twitter @themongrelpunt, or check out our Facebook page for more articles like this, and some shorts as well. Newer PostWho can win the Dance with Rance? Older PostSam Newman - The Most Relevent Irrelevent Man in Football.